At the July SCPCUG Monthly Meeting our resident Guru David Nottingham showed us the roll Windows XP plays in making Digital Photography easier. 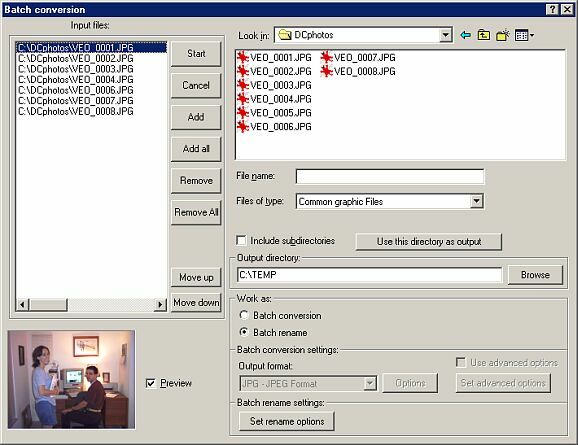 One of the new features offered by Windows XP and demonstrated by David was the batch renaming of the JPEG photo files from a digital camera. More than a few of the audience members were impressed by this. Well those of you, like me, that have not yet moved to Windows XP can take heart. We too can do the same and even more by using a program I have mentioned several times in this column, IrfanView (http://www.irfanview.com). If you have not installed this free for personal use program yet, you are doing yourself a real disservice. I first reviewed IrfanView in my June 2000 Web Master Wanderings column (http://www.scpcug.com/wmwand17.html). With each new update IrfanView has more features and gets better. The current release is version 3.75 dated July 15, 2002. The basic program is a 812 KB download that unzips to 1.20 MB. But to really take advantage of all IrfanView has to offer you need to download the all_plugins file which is a 3.35 MB download and unzips to 4.45 MB. Later I will walk you through how to do batch renaming and conversions with IrfanView but first a little background. Digital cameras are capable of taking many photos which are usually saved to some form of memory. I have a Veo Capture 1300 1.3 Megapixel Digital Camera (http://www.veo.com/Capture1300/capture.asp). What you never heard of the name Veo? Neither did I until I bought this camera. Burdines Department Store was offering the camera as a promotional item around Christmas. The manufacturer's suggested retail price is $99.99. Burdines kept reducing the price to clear out their inventory. Finally, I could no longer resist. I got the camera with a great 3-program Arcsoft software bundle for only $42.50. Have not seen a 1.3 Megapixel camera with similar features (like a 1.5" LCD color view screen) near that price since. But I digress--back to my story! My camera has eight Megabytes of SDRAM internal memory but also allows for installation of CompactFlash cards (removable memory). I normally use a 64 MB CompactFlash card which allows for the storing of over 120 photos at the best compression setting and highest resolution (1248 x 960 pixels). As with all digital cameras the photos are stored in numerical order. In my case the automatic naming starts with VEO_0001.jpg and numerically progresses up (VEO_0002, VEO_0003, etc.) as more photos are taken. Such nondescript automatic naming of photos can cause a bit of work when hundreds of photos are involved. Most people want a more descriptive file name. At the very least one might want to group photos according to subject matter, location, or date. To avoid having to rename each file individually, batch renaming is needed. IrfanView offers this feature. After opening IrfanView click on File. In the resulting dropdown menu, click on Batch Conversion/Rename. This brings up the Batch conversion screen. On the right, under Work as, select the Batch rename radio button. Using the dropdown arrow next to the Look in window, browse to the location on your hard drive where you have work copies of your camera numbered photos stored. To prevent inadvertent loss always use duplicate (work) copies of your camera originals. Now you can add either selected photos (by individually highlighting them) or all photos to the Input files window on the left by clicking the Add or Add all buttons respectively. Deciding on which photos to add selectively is made easy by using the Preview image window at the bottom left. You can also change the sequence of the files being renamed by using the Move up and Move down buttons. Now that we have our Input files selected, click on the Set rename options button near the bottom. A Batch rename settings screen pops up allowing you to select a Name pattern and Starting index number. Here is where one decides how to categorize the photos. For illustration purposes, I took a small group of photos originally labeled VEO_0001 through VEO_0008 minus the VEO_0005 photo (not added to the Input files window). In the Name pattern window I typed in 03Aug02_Tampa_Trip_##. In the Starting index window I typed in 1. I next clicked the OK button which brought me back to the Batch conversion screen. Clicking on the Start button started the renaming process which took less than a second. When completed, I got a Batch conversion done screen showing the input and output file paths. This screen would also show any errors or warnings if there were any. In this example the output files are now located in the C:\Temp directory. The seven JPG files are renamed and renumbered 03Aug02_Tampa_Trip_01 through 03Aug02_Tampa_Trip_07. While the batch renaming that IrfanView offers is a nice time saver, it is the batch conversion that really makes my day. Let us now look at that. Again, selecting Batch Conversion/Rename from the File dropdown menu brings up the same Batch conversion screen. This time however, under Work as, select the Batch conversion radio button. The process for selecting the input files is the same as for batch renaming. Now, under Batch conversion settings select the Output format. The Output format dropdown arrow provides a choice of 16 different graphic formats. Pressing the Options button will give you appropriate options for the selected output format. For example, when I output to the JPEG format I usually select a compression Quality setting of 85. For a TIF output I either select None or LZW for the TIFF Save Compression depending upon my expected use of the output file. If I am printing the photo, I select None. If I am e-mailing the TIF photo, I select LZW. We could now press the Start button and IrfanView in a second or two would convert the batch of selected files from one graphic format to another. But the real meat of the batch conversion process is in using the advanced options. Placing a check mark in front of Use advanced options activates the Set advanced options button. Pressing that button brings up the Set for all images screen. Here you have a vast array of changes that will be made to all photos in the batch. I use this for resizing down a batch of photos from my camera originals of 1248 x 960 pixels to a more reasonable 624 x 480 pixels for e-mail attachments. Using the previously mentioned compression Quality setting of 85 results in an original 455 KB file size being reduced to 82 KB. Another thing to keep in mind is that when you resize photos (or graphics), the resulting image usually looks slightly blurry. After doing a resize on a single (test) image, I can then decide on how much sharpness to add for the batch by sharpening the test image at several values and viewing the result. It's a subjective thing requiring trial and error. Only you can decide how much sharpness is enough. The default sharpen setting in IrfanView is 20 with a range of one to 99. To set sharpness in IrfanView, load your photo and go to Image | Effects | Effects Browser. You are now looking at the Image effects screen. Select Sharpen and you will see a before and after comparison of your photo along with the Sharpen Filter settings Value. The before and after thumbnail photos may not be large enough to get a good sense of the result. In that case, pick a sharpen Value and click the Apply to original image button. If you don't like the result go to Edit and click Undo. Now go through the same process again until you are happy with the result. I find a sharpen value of 15 usually works for me in resizing from 1248 x 960 to 624 x 480 pixels. I have walked you through only two of the items you can do with batch conversion under Set advanced options. Size reduction and sharpening are the two I find most useful. But if you look at the Set for all images screen you can see there are many more items that can be selected and explored such as changing the brightne ss, contrast, color depth, DPI (Dots Per Inch), etc. Clicking the EXIF info button brings up the EXIF information screen with a large list of info that will vary by manufacturer and camera model. From this you can tell things like what camera make and model took the photo, what firmware was used within the camera, resolution, exposure time, shutter speed, if a flash was used, etc. If your digital camera has a built-in clock it will give you the date and time the photo was taken. My camera does not have an internal clock so what I get is apparently the date and time of the last firmware revision. EXIF information could be very useful in deciding which digital camera to buy. It gives you a real peek as to what is under a fancy camera exterior. The trick is one would need an original saved photo from each camera of interest so that a comparison of the EXIF information could be made. To learn more about EXIF go to EXIF.org at http://www.exif.org/. The Exchangeable Image File Format is a standard for storing interchange information in image files, especially those using JPEG compression. Most digital cameras now use the EXIF format. The format is part of a standard to encourage interoperability between imaging devices. At EXIF.org you will find a forum, sample images with EXIF marker sections, programs, specifications, and proposals. Currently under programs only one program is listed. 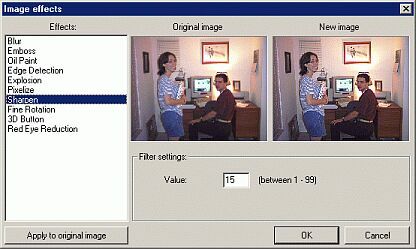 It is a free program called Photo Studio available at http://www.stuffware.co.uk/. Photo Studio is a multi-purpose image management tool with full EXIF support. It is a useful tool for examining and manipulating the contents of additional data stored along with your images. It even allows for adding comments to your stored image which IrfanView will then recognize with an added JPEG Comment button on the Image properties screen. Note that Photo Studio is under development and currently has no Help file within the program. However, the Help file is available in HTML format from the Photo Studio web site. With respect to EXIF information, IrfanView now has an important additional capability that previous versions did not. This new capability may not be immediately obvious. When you resave your camera original photo after processing in IrfanView (cropping, resizing, sharpening, etc.) the EXIF information will now be saved with your new image. The option of resaving your processed image with the original date/time is also available. After you have processed your digital photos in IrfanView you might want to display them on your computer screen as a slideshow. IrfanView has this capability. You can even play music in the background by first loading a music file such as a MIDI, MP3, or even a MP3 playlist (.M3U). Once the music starts playing, you load and start the slideshow. I will let you explore that on your own as the slideshow screen for loading the photos is similar to the batch conversion screen . As is usual with IrfanView there are many options to choose from. So just go to File | Slideshow and have fun.